Well, I've been a lurker here for more than a little while, and have been debating if I should post to this forum, but since I'm getting close to finishing the ship, I figured, why not? 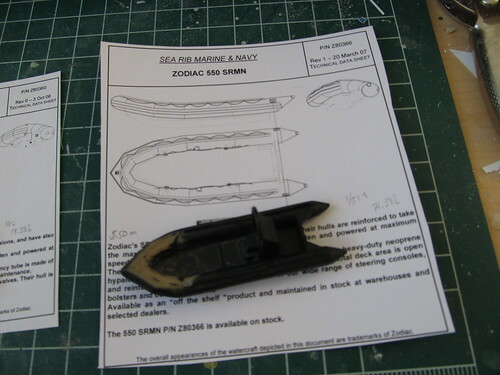 So, bearing in mind that this is my first scratch-build, my first ship and well, I'm a former member of a armoured regiment so my knowledge of all things Navy is limited--and perhaps a bit biased --here is my current project. I have a debt of gratitude especially to Darren Scannell of the Resin Shipyard, as without his assistance and patience with my stupid questions about ships this project wouldn't have been started, let alone nearing completion. 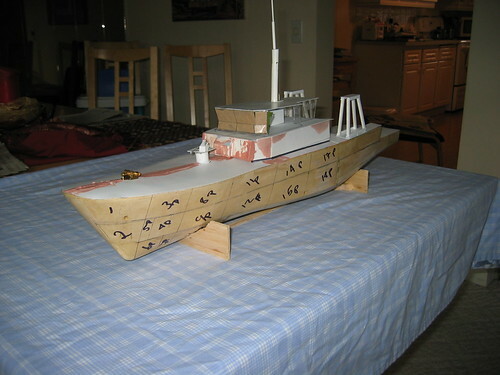 As well, I thank several other board members who have helped answer questions or offer advice--and not to mention the amazing reference materials that exist here as the completed builds of a variety of ship models large and small. This board is home to some master craftsmen, and I aspire to that level of quality myself one day. 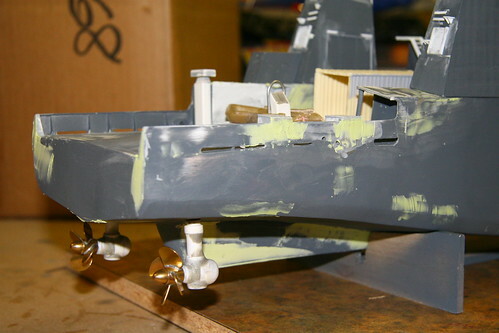 One further note: This was a Navy Centennial build, and should have been completed last year, but a kink in the form of a broken ankle in December conspired to delay it. Nonetheless, when I started, I'd not considered posting the build, so some of the early photos are taken with my Blackberry, and are of dubious quality. More on that my next post. Thanks for listening to my rambling. Same here, rather rare subjects, but interesting ones for sure! I expected somewhere an error in the plans as there is a fairly strange bulge in those first pics. Not a disaster though, if you never try, you'll never make a mistake (but you'll never have a model either!). I'm sure such mistakes have been made by many over here. I too had a frame sticking out somewhere by bad alignment. You learn from the experience and as far as I can read in the beginning of your topic, you're nearing completion = you fixed the problem along the way! Hi Sean welcomes to scratch build. Identifying any error is one thing correcting the error is another but to show and mention this on your first build on a web board devoted to scratch building takes some doing and for that alone you deserve a commendation .Any way your first build is a good deal better than my first built . Good to have you aboard. 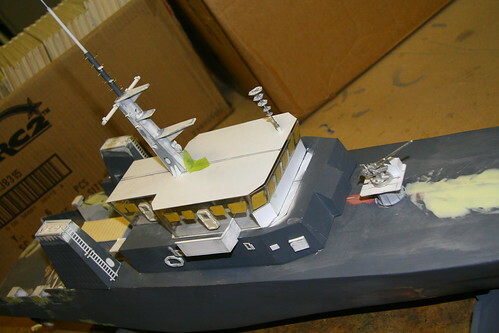 Welcome aboard Looking forward to your build.When you scratch build you encounter proublems that have to be solved .How you solve them is what makes you a Model BUILDER. .
At this point, once I'd reshaped the amidships bulge, added a 1" plug just forward of where the Bofors would mount and re-shaped the bow block with generous helping of wood putty, I sanded the living hell out of it and sealed the wood with several coats of acrylic varnish. 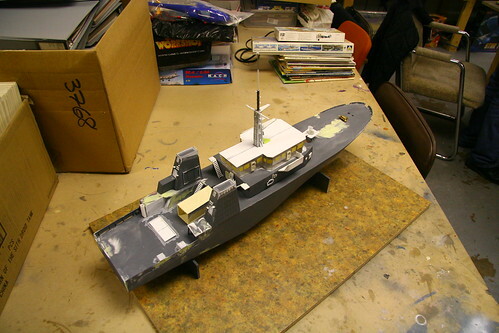 I initially planned on coating the wood with a thin layer of Bondo, but my good friend Dennis Kaye (an amazing ship-modeler in his own right, and someone who has been like a mentor to me on this project) suggested I use lithoplate. In an attempt to replicate the actual hull plating, I marked up the hull with panel lines and numbers indication what plate goes where--hence the weird look of the hull. The hawse-pipes were drilled out and brass tube fitted. I'm using a Billing's Boat winch, but it's being modified as it's not exactly the same as what Summerside has. 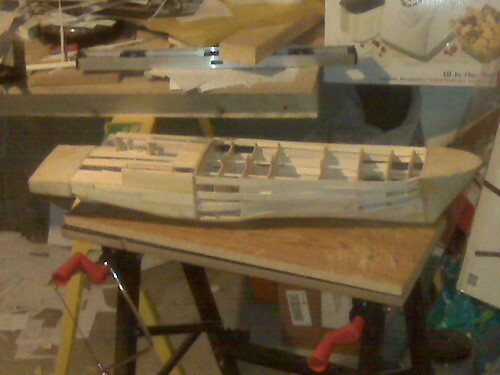 I still have the cardboard bridge as I was still having trouble getting the angled-outwards part of the bridge right. These photos were taken by my Dad who was out in Calgary visiting. 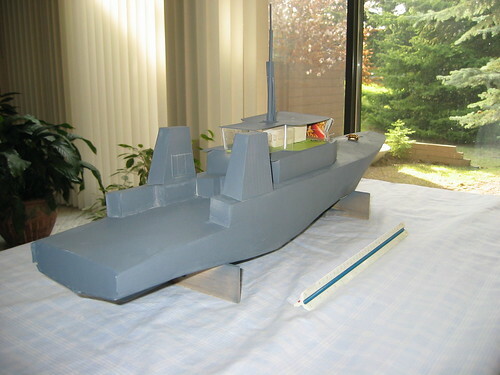 He was heading back to PEI the end of May 2010 (around when these photos were taken) and wanted to approach the Charlottetown Naval reserve, HMCS Queen Charlotte, about the possibility of me donating the completed model to them--lord knows I don't have room in my house to display it properly. Being an architect, my father wanted some good scale photos to take to the Queen Charlotte. Thanks again for the interest Guys. More to come. It's great to see another Cdn build on here and a nice ship too. I will be watching you posts with great interest as I am sure I will be building one of these vessels in the future. Thanks for the interest in my build. 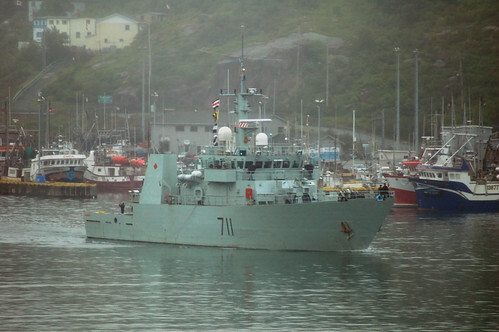 I have lots of photos of the Boffin mount on the Hiada as she in only 30min down the road from me. If you like, I can e-mail them to you. As I don't have many close ups of the actual 40mm mounts on Assiniboine, I will just use the Hiada version and say close enough. I am planning to use the Airfix 40mm Bofors for the barrel but I have not actually scaled that yet to see if it is 1/72 or 1/76 as Airfix kits vary alot between what the box says and what is inside (for armour anyways). I have build the power moduals and have worked on the bases for the guns but haven't posted any photos yet. Hopefully this weekend I will get something done. Thanks for the offer of photos, but we actually have an old boffin mount here in Calgary at the Naval Museum. I've had the opportunity to minutely examine it, along with the 12 pdr 12 cwt as well (but that is for another project). Truth be told, the older boffin mounts are quite a bit different from what's mounted on the Kingstons; but thank you anyway. I've built mine up using the White Ensign Mk 3 kit--granted it's a USN rather than RN/RCN version, but I'm not using much of the mount, and I figured the barrel and breech would be close enough for jazz Sadly this means I don't have much advice regarding the Airfix Bofors to pass along.... AFAIK however, the Airfix kit is actually 1/76 so it may be a mite small and spindly in 1/72, but I can't say for sure. Right. 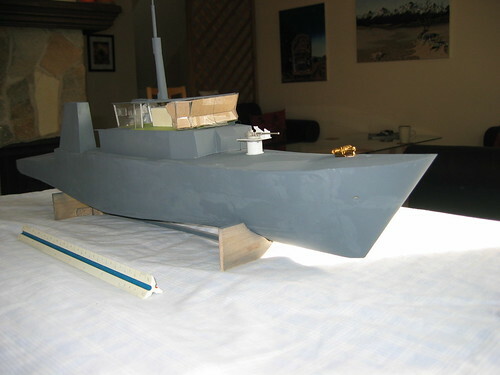 At this point it was late May 2010, and I took the Summerside as you see it here to the model show in Nanton, AB to display (as opposed to competing) along with other completed and not so completed projects (including a friend's 1/350 starship Enterprise WIP--very cool). She generated no small amount of interest from people who I spoke with, and I brought home a bronze for my 1/700 Alfa waterline (which also appears in this year's Great Scale Models), and add to that my daughter winning Best Junior Auto and we had a pretty good time. 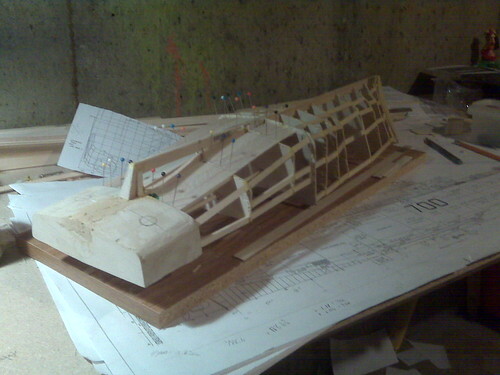 Throughout the summer progress slowed as I worked mainly on final major bits of construction (like the bridge bulkheads, which gave me fits trying to get the geometry of the angled outwards parts correct). 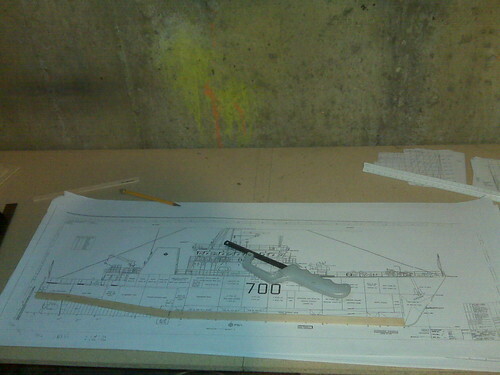 I also began to scratch some masters for fittings like bollards, bull-rings and water-tight hatches. 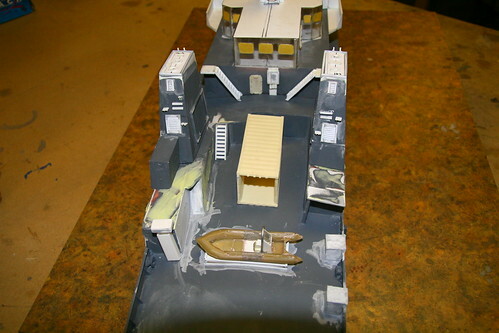 As you can see, there's a fair amount of filling and sanding of the hull still to do, but the bits and bobs were coming together to look like a ship. Another view from the stern. 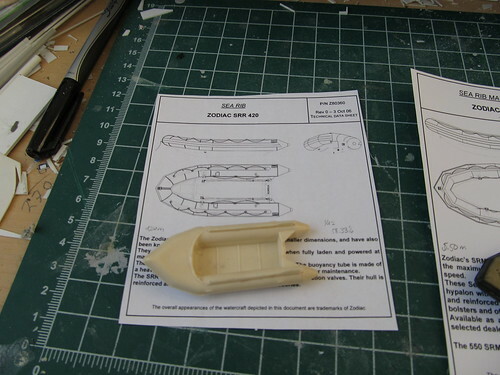 The RHIB is a resin copy of one that came from the old Revell 1/72 Cousteau Catalina. 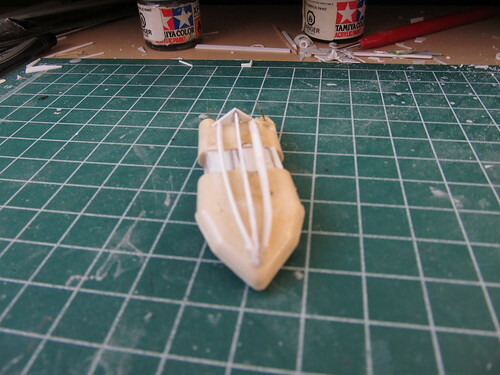 I made a mold of the assembled boat and took the first usable resin copy, and added a 1 cm plug to enlarge it using styrene for the floor and Apoxie Sculpt for the sides. 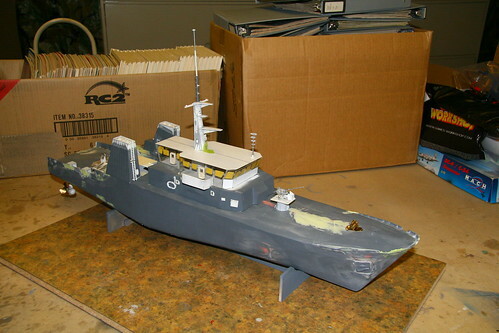 As I'm planning on building the HMCS Charlottetown in the future, I'm thinking of casting a copy of this RHIB as a starting point for that project. The props are left and right handed, and were bought at my LHS. The Kingstons have z-drive, so I had to build the azipods, but didn't need to build a rudder, so I guess it all evens out. 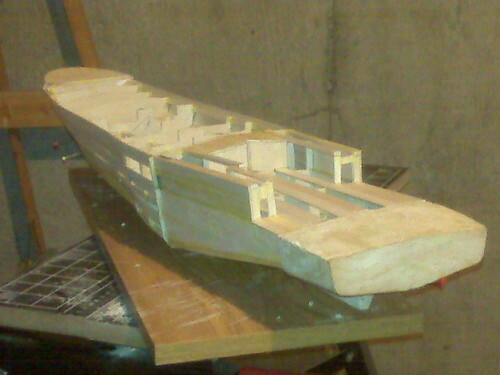 As you can see I've started the gun mount and mast here. The model was originally designed to be lit, but as time moved along I decided I'd leave experimenting with lighting to another project. Nonetheless, the mast is still built on a brass tube to allow for lighting later. The yardarms are plastic rod with blobs of CA at the ends to form half-spheres. And here's the bridge. As you can see, I've finally gotten the geometry of the outward angled parts correct (what a nightmare that was--I had to rebuild this part four times until I was happy with it). 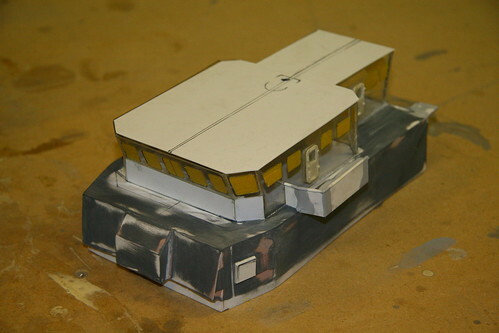 I've also built the bulkheads out of clear acrylic on the advise of a member of the local model club--he suggested that it would be easiest to simply mask off the windows and paint the rest so I needn't worry about fiddly window-making. You can also see that I've cast some of the hatches and mounted them using Crystal Clear glue. 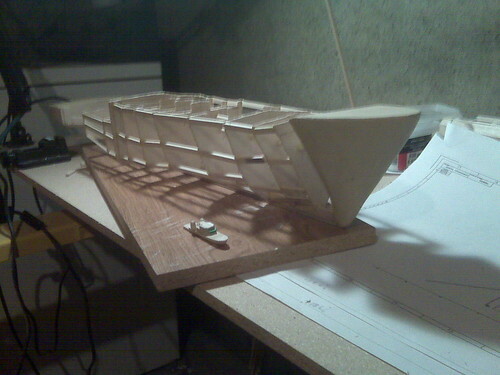 The bridge wings are roughed in, and the final finish of those will go on when I'm ready to do the railings. 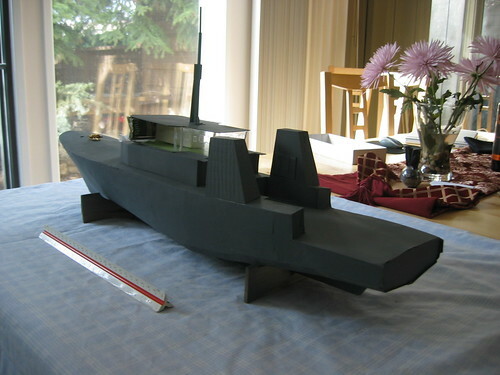 hello sean,the summerside is looking bang on good.the casting of the rib is also good.what type of moulding and casting material do you use.i live in campbell river and run a small passenger and frieght boat up and down the coast and quite often run into this class of ship. Hi Sean your build is progressing well . 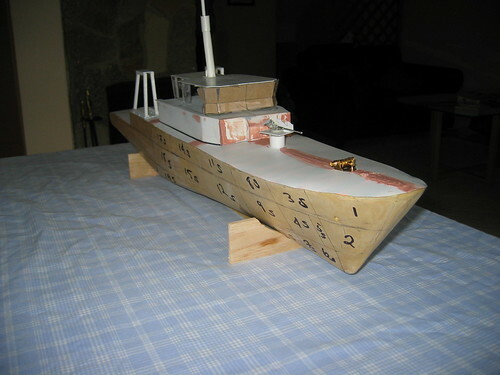 An interesting ship and it would be just as manageable at the larger scale of 1:48 ? wow the model looks superb! Thanks for the info on the Airfix Bofors. I will have to scratch build one. I looked at the flickr photos, how did you do the dimpling on the funnel casings? The ship is looking very good. Thanks James. I created the "dished" effect on the funnel casings by marking a grid in pencil that matched the visible frames I saw in close up photos and then drew a curved #10 blade "backwards" in-between the pencil marks--that is, the sharp end was at the trailing, rather than leading edge of the draw. It's worked all right I guess, but I'm not 100% happy with it. I think it could have been done better with some pre-shading during the painting phase, which is how I'm planning on replicating a similar effect on the hull. After studying the photos I had however I noticed that the Zodiac didn't quite look the same, and in fact there were two, a longer one and a shorter one. So with some trepidation I elected to make a mold that would allow me to make modifications without ruining the only injection molded copy I had. 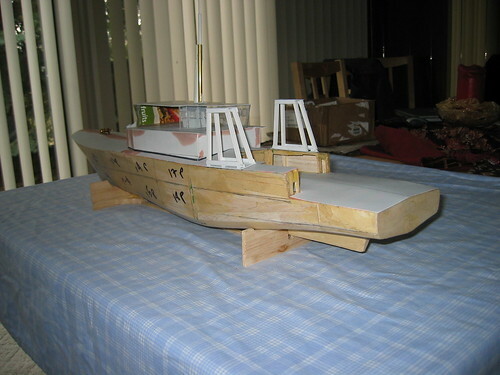 I built a stretched version by cutting one of the copies in half, and inserting a pair of aluminum rods into the "pontoons" and rebuildin the floor and keel of the inserted "plug" with sheet styrene and Apoxie sSculpt. I added an operator's station and a "roll-bar" and threw a quick coat of paint on it. After some time I came back to finish it off, but I wasn't happy with how it looked--it wasn't as beefy as the photos I had showed the original to be. After poking around the Zodiac website, I downloaded some of their sales materials, and scaled the plans to 1/72. 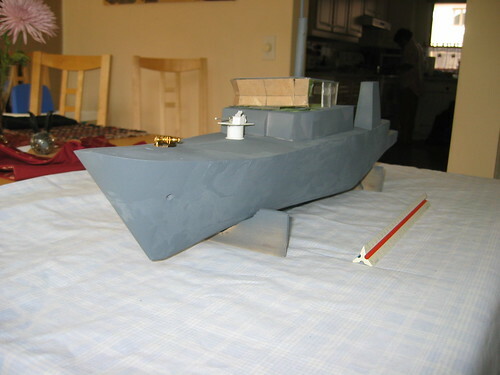 As you can see, in comparison the model zodiac is too pointy at he bow , and lacks the deep, rigid keel of the prototype. By comparison, the non-stretched zodiac looks not too bad, save for the point of the nose. 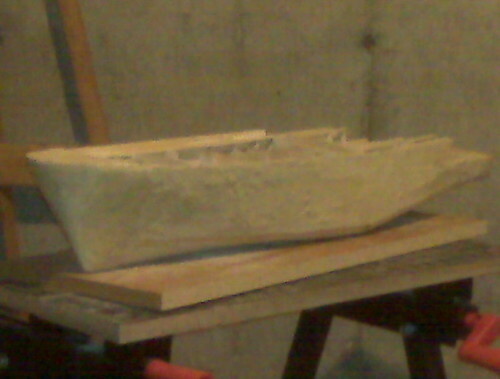 This I'll fix by carving away the attached bow tarp and the "point" and re-shaping it with Apoxie Sculpt. For the "stretched" version, I again cut a resin copy in half down the middle, and lengthened it using aluminum tubing. 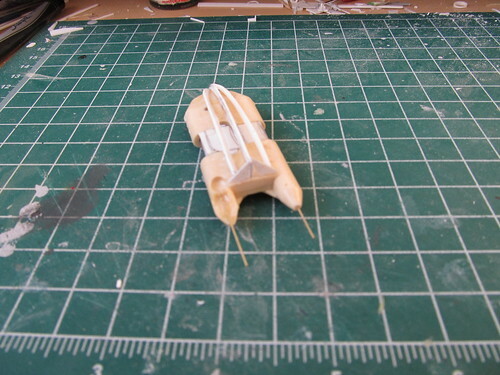 This time however, I also built up a keel cut from plastic sheet. As photos show this bottom sections with a pair of chines, I added them using additional curved sections of plastic sheet. It's all pretty rough right now, but I'll be using Apoxie Sculpt to fair things in and sand it smooth after. Aaaaannnnnddd....this is what you get when you don't have a means for air to escape from your molds. The bubbles are an easy fix, I just fill them with either Apoxie Sculpt or Superglue, but the tips of the pontoons need to be rebuilt. I drilled a small hole in each and inserted a length of brass rod, cemented in with superglue. I'll rebuild the tips with Apoxie Sculpt, but as I plan on casting copies of the finished Zodiac, I'll leave the rod untrimmed, allowing for an pocket air can escape into to when pouring resin so the tips aren't obliterated by bubbles. hi sean,i like the rib,s very much,when you are making your moulds do you have a vacum pot or somthing to degass the silicon before you pore, or does the stuff you use need it.i do not have a means of degassing,and no mater how easy i mix lots of tiny,tiny bubbles get in. Do you have a pressure pot? In the not so tropical climate of the Great White North. Nothing fancy with my set-up--I don't have a pressure pot or vacuum chamber to degas the silicone or the resin. The up side is it forces me to think really hard about how to best design the mold to alleviate the issue of bubbles. As can be seen my first attempt with the zodiac wasn't so good, but thanks to that experience I've got some ideas about how to cast the next set. 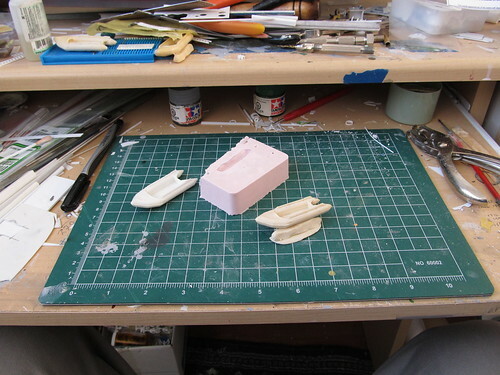 The downside is I spend hours sitting and watching silicone and resin cure, using a toothpick and a tiny brass wire to prod and poke bubbles out of the molds and castings When I say I hand-crafted a cast resin part, I really mean it!